Below, we show you around the Aughrus Peninsula - not a comprehensive tour, since getting to know a place when you're on holiday is part of the fun - but just enough to orientate you so that you won't feel lost. What we're going to describe is THE AUGHRUS LOOP. This is part (and a lovely and easily accessible part!) of The Wild Atlantic Way - being put in place in 2014 by Bord Failte, the Irish Tourist Board. It's also a great way of introducing yourself to the Aughrus Peninsula and all it has to offer. Whether you're planning to stay for a while in this area - and we hope you are - or whether you're touring Connemara and merely passing by, The Aughrus Loop is a well-worth diversion. It starts and finishes on the N59 main Clifden-Leenane-Westport road, so that a detour around the Aughrus Loop (the Peninsula) will not take you permanently off your track if you're headed elsewhere. Note that this is merely an introduction. For descriptions of other parts of the Aughrus peninsula to explore on foot or in your car or on your bike - and to read about some of the many other activities you can engage in - apart from just relaxing, of course - click on the other sub-menu links at the top of this page; or some of the other main links at the top left-hand side of every page on this website. First, a sketch map, to show you some of the main locations. Just click on the link below to download a hand-drawn A4-sized sketch map of the Aughrus Peninsula. Or click the thumbnail below the download link, for an instant illustration. As you will see, the Aughrus Peninsula is a headland jutting into the Atlantic Ocean, containing the villages of Cleggan (on its northern side), and Claddagduff on its southern. The narrow inlet on the Peninsula's south flank is called Streamstown Bay; the wider inlet on the north flank is called Cleggan Bay, with Cleggan Head on its northern shore. Sometimes wild indeed, as in the photo above, it is more often mild and welcoming - though its landscape is always rugged. There is a series of islands lying offshore, including Omey Island, which you can reach from half-tide to half-tide (see below and for more on Omey, click here), and Inishbofin, which you can reach by ferry from Cleggan Harbour. If you're travelling from Clifden, take the N59 signposted to Westport, and after about 3km (just after where the famous Sky Road emerges back onto the N59), take the LEFT turn signposted for Claddaghduff and Omey Island. If you're travelling from the Westport/Leenane/Kylemore direction, watch out for where the main road takes a 90-degree turn to the left (2km past Cottage Handcrafts, which you will see on your left). See the blue sign advertising Cleggan Fishing Village, and take the right-hand turn signposted for Cleggan and Inishbofin. Let us suppose that you are coming from Clifden (if you're coming from the other direction, simply go through this description backwards...). That means you start the AUGHRUS LOOP by taking the left-hand turn signposed for Claddaghduff and Omey Island. The drive starts by bringing you along a road right beside the sea - along the northern shore of the narrow inlet called Streamstown Bay. This is a lovely drive in itself, a few km in length. Some km along, you will pass an ivy-covered ruined building, which is Doon Fort. A bit further on, and the Atlantic Ocean opens up ahead of you. The island with the crrags on its right-hand extremity, making it look just like a prehistoric creature of some sort, is Cruagh Island (locally pronounced "Crow Island"). Just follow the road, and enjoy the changing view of the Atlantic, with other offshore islands coming into view: Friar Island and High Island, and other, smaller islands. To the right is a stretch of flat bogland, with hills yonder. Soon enough, you will see the cluster of buildings, with Church, shop/post office and bar, which is Claddaghduff village. Proceeding down the small road beside the church brings you to Omey Strand and - between approximately half-tide and half-tide - the sand is dry enough to allow you to walk or drive across to the island and look around. Mary Sweeney and Malachy, proprietors of Sweeney's shop/P.O./Strand Bar, are experts on the tide times, and we advise you to check with them for the times when you'll be able to cross safely to the island - and to return without being cut off! It's a really beautiful island, and well worthwhile taking an hour, or preferably much more, to look around. Many people like to picnic there, or swim at the beaches on the island, or even camp there overnight, remembering to bring all provisions with them, since there are none to be had on the island. Omey Island is such a lovely place to explore that we provide a separate page to describe more fully the island, and what you can expect to see there - click here to access the Omey Island page. 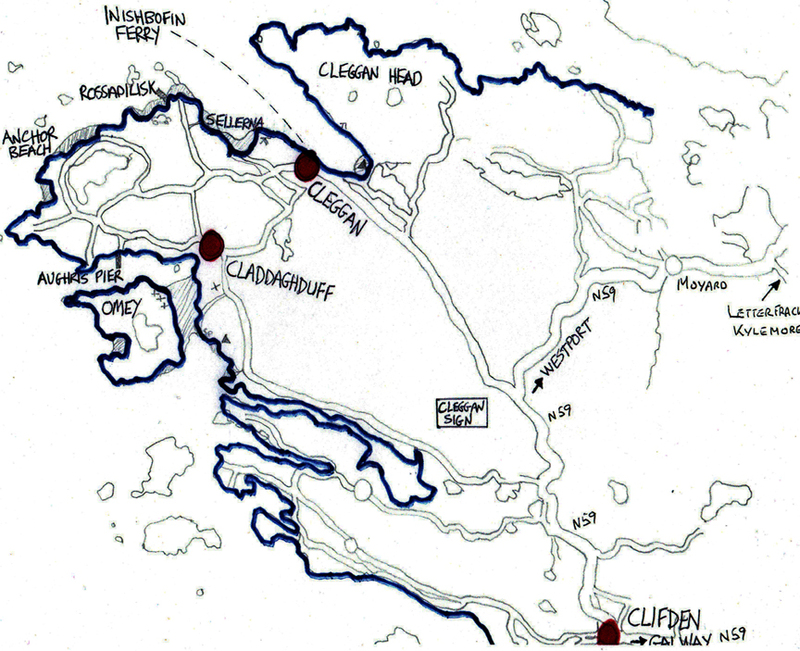 You may wish to stop for refreshments in Sweeney's Strand Bar; and then carry on around the Aughrus Peninsula. The drive will bring you along a picturesque narrow road through the townland of Patches, and then into the much larger townland of Aughrusmore (big Aughrus). At this point, you have two choices - to stay on the upper road, or take a left-hand turn which will bring you around a large lake (Aughrus Lake). If you choose the latter, you will return to the shore's edge after a while; if the former, you will enjoy more elevated views of the Atlantic and the islands; the choice is yours! If you take the turn left, to follow the lake, you will be headed towards Aughrus Point. One road will bring you down to Aughrus Pier; another (where the road takes a right-angle to the right) will bring you to a cul-de-sac, where you can stop and walk on out to Aughrus Point itself. Carrying on around the lake will bring you past meadows covered with wild flowers in the Spring (some of the fields are literally covered with yellow primroses in flower, during the Spring months), and always with numerous Connemara Ponies grazing. And as the road passes down to run right beside the sea, you'll pass clusters of beautiful small beaches, including the "Anchor Beach" (a picture of which is at the top of all these pages, and a photo of the anchor itself is to the left). This is Aughrusbeg ("Little Aughrus" - and, as we have noted on our home page, "Aughrus" itself means "Promontory of the horses") which includes the locally known Anchor Beach, named after an old anchor lying there, a relic of the "Verity", a three-masted 1,000 ton barque built in Quebec in 1898 and wrecked off Aughrus Point just a year later, in January 1890, with the loss of two lives. The Verity's home port was Yarmouth, Nova Scotia, and on this fateful voyage just over a year after she was launched, she was in ballast with a small load of sand and shingle, out of Waterford, with 20 crew and passengers, bound towards sandy Hook. In a strong gale well to the west of Slyne Head on 29th December 1889, the head of her lower main topsail became detached, and the master sent all hands aloft to furl it. At that time she was thrown on her beam-ends and lost her bowsprit, followed by her foremast, mainmast and mizen mast, with 14 hands aloft. Of the 14, 12 fell inboard with some injuries, but two were lost overboard and drowned. A steamer of about 2,000 tons past close to them but failed to go to their assistance, despite seeing her plight. On 2nd January, 1890, a passing schooner did send up rockets, but also failed to render assistance. Various efforts were made from 29th December to 3rd January to assemble and maneouvre with a jury rig, but the vessel had been badly holed by the falling spars, and on 4th January they sighted Slyne Head lights. Some time after, with the realisation that she could not clear Slyne Head despite her jury rig, the decision was made to lower the boats and abandon ship. The Verity struck rocks near Aughrus Point, and became a total wreck. No further lives were lost in the abandonment. Anyway....notwithstanding this tragic story, this is just one of the lovely places to swim, and a favourite for families with children, since the sea is (almost) always calm, and the beaches safe. Again, the area around Aughrus Lake is so lovely, and there are so many places to see and explore, that on a separate page we describe a walk around the lake in greater detail - just click here to reach the Aughrus Lake page. If you choose the upper road, rather than looping around Aughrus Lake (of course, you could do both! ), this higher road is further from the sea but the elevation gives you beautiful views of the ocean and the offshore islands, such as famous High Island, which in the seventh century was a penetential outpost of the Omey Island monastery, founded by St Feichin, and described so well by Tim Robinson in his book "In the Pool of Darkness" - see the "Further resources and reading" link on this site. The photograph above (and that below) was taken at sunrise, from the top of Aughrus Hill, an easy climb from the upper road. Continuing on around the peninsula, in the direction of Cleggan, you will see the salt-water lake Lough Atalia ( not to be confused with the "Lough Atalia" that is in the very centre of Galway city) opening up before you - is is connected to the ocean by a winding creek; so it is in fact part of the sea, and not a lake. The photo to the right shows Lough Atalia from the high ground of Aughrus Hill, with Cleggan Head, on the other side of Cleggan Bay, beyond - taken at dawn, just as the sun is rising in the summer. In contrast, the photo on the left was taken during one of our spectacular summer sunsets. It shows the view that will greet you as you pass a little further along the Aughrus Loop, before you reach the turning down to Rossadilisk (see below). In this photograph to the left, you see two larger offshore islands. On the left of the photo, Inishark, which used to be inhabited but was finally abandoned, in 1960. On the right of the photo you see the southern end of Inishbofin, still very much imhabited and reached by ferry from Cleggan Harbour (see "Things to do" for a suggestion of a day trip to the island, and links to the ferry timetables). Carrying on a little further in the direction of Cleggan village, you will see a left turn signposted to Rossadilisk - the tiny village and fishing harbour of Rossadilisk was the place from which some sixteen men were lost, in the so-called Cleggan Bay Disaster of 1927, which also claimed the lives of many men from Inishbofin and from Co Mayo. Nowadays, the cottages and houses of Rossadilisk have either become ruined cottages, or have been rebuilt into homes and holiday homes. The small natural harbour is there, with a small pier, and during the summer months fishing currachs and other small boats are moored there. Rossadilisk strand is a lovely place to walk, or to swim from - you can walk onto the strand from the end of the road (just before the cluster of houses at the end), and all the way around, past the harbour. The sea at the beach near the harbour is often warmer than elsewhere, as the rising tide comes in over the warm sands. Turning right on the way down to Rossadilisk (see the sign for Rossadilisk House and Lacey's Cottage), you will come to Tra Bhride (Brid's Beach), a really beautiful spot looking across Cleggan Bay, out towards the islands, and up to the head of the bay and on to the Twelve Pins mountain range. Back onto the main road, and further along, just by the white sign marking the boundary of Cleggan village, a left turn signed "Tra" (which means Beach in Irish) brings you to the large sweep of Sellerna Beach. There is an ancient dolmen, dating to before the Great Pyramid, in the fields just beyond the beach. There is grand swimming to be had from Sellerna Beach, and families with young families enjoy spending summer days there. Do note that currently (early March 2014), Sellerna Beach still shows much damage from the storms in January of this year - boulders and stones thrown around the beach and dunes. Hopefully time, the sea and the tides, and a bit of assistance from the community, will set things to rights again by the time the summer season comes around again. So to Cleggan village itself, with its working fishing harbour. The catches are mostly shellfish: crab and lobster, but also other fish; each weekend, catches are gathered together at Cleggan Harbour, where they are lovingly packed, live, in containers of continually aerated seawater, and transported by truck to the Continent, where they grace many a fine restaurant table in France and elsewhere. Of course, you can enjoy them even fresher from the sea, here on the Peninsula! At the harbour, there's a slipway for launching boats for diving parties and angling; angling boats for holiday fishermen; and among the houses of Cleggan, a shop/Post Office, four bars - the Pier Bar, Oliver's Bar and Restaurant and, further along, Joyce's Bar and Newman's Bar. Bar and restaurant food is available in Oliver's, in the Pier Bar, and in the Tiny Teapot just at the head of the pier. The ferry to and from the island of Inishbofin plies from Cleggan Harbour; and the Citylink bus service connects Cleggan to Letterfrack, Clifden and Galway city. Cleggan Harbour - the inner part - was designed and constructed by the famous engineer Nimmo - who oversaw so much construction in the area, including Clifden town itself. To protect small vessels from the scend entering the harbour during strong Nor'-Westerlies, a boom (series of strong planks) could be slid down grooves on either side of the inner harbour entrance, using a small crane, to form a closed-in harbour 'pool' - the planks and the crane are there still today. Passing straight through Cleggan Village, on a 'bog road' passing bogland and 'eskers' of gravel (depositis from melting glaciers at the end of the Ice Age) and stands of spruce and pine, in about 5km you will return to the N59 main Clifden-Westport road; and you have then completed the AUGHRUS LOOP. We hope you thoroughly enjoyed it! There are lots of other places to explore on and around the Aughrus Peninsula - inland roads, bogland, small lakes with brown trout. And all along the way you will have passed lots of holiday homes of all sizes, for rent, as well as B&Bs. During the summer months, the roadsides and meadows are teeming with wildflowers and birds. And there is always the chance of spotting the Irish Stoat, Otters, Common Lizards, Irish Hares, and a host of butterflies and moths.